Catholic Youth Ministry responds to needs of young people and encourages the sharing of their unique gifts with the larger community. Efforts are directed at fostering the total personal and spiritual growth of young people and drawing them into responsible participation in the life, mission and work of the faith community. See Calendar of Events. Catholic Charities Summer Institute (C2SI) — This five-day immersion experience in July teaches teens about Catholic social justice issues and how the Church is responding through the ministries in Catholic Charities of Arkansas. Catholic Youth Convention — This weekend event held in April offers youth statewide to the opportunity to celebrate their Catholic identity through skits, music, prayer, speakers, workshops, Mass and more. Diocesan Confirmation Retreat — This peer-led, day retreat is offered in February for youth preparing for confirmation who are unable to attend a confirmation retreat in their area. Junior High Youth Rally — This daylong event held in the fall is for students in grades six through eight. It includes a speaker, praise and worship, lunch and Mass. National Catholic Youth Convention (NCYC) — This three-day national event is held every other odd year. It offers workshops, concerts, tours, exhibits, Masses, prayer services and more. Region 10 Catholic Youth Conference (RCYC) — This three-day regional event is held every other even year. 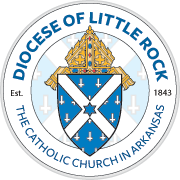 It is composed of the dioceses in the Region 10 states of Arkansas, Oklahoma and Texas. Search — This intense weekend retreat for 11th and 12th graders is held three times a year. It explore in-depth topics such as: who am I? who is Jesus? prayer, communication, reconciliation and more. Senior High Youth Rally — This one-day event for high school youth is designed to “kick-off” the new school year with God as the center of it all. Weekend for Life — This annual pro-life weekend coincides with the Arkansas Mass and March for Life in January. It focuses on right-to-life issues through a youth perspective. "What is needed today is a Church which knows how to respond to the expectation of young people. Jesus wants to enter into dialogue with them and, through his body which is the Church, to propose the possibility of a choice which will require a commitment of their lives. As Jesus with the disciples of Emmaus, so the Church must become today the traveling companion of young people ... ” (Pope John Paul II; "Youth: Sent to Proclaim True Liberation," World Youth Day 1995, Philippines). The U.S. bishops accepted the challenge of the Holy Father and stated their response in the form of a written document titled "Renewing the Vision" (1997, U.S. Conference of Catholic Bishops). This publication offers three essential goals regarding the Church’s ministry with adolescents: Empower young people to live as disciples of Jesus Christ in our world today; draw young people to responsible participation in the life, mission and work of the faith community; and foster the personal and spiritual growth of each young person. For more than 50 years, the Diocese of Little Rock has been responding to the needs of young people in the Catholic Church in Arkansas through the efforts of a diocesan Youth Ministry Office. Today, the office continues to respond to the needs of our Catholic youth and parish youth ministry directors through a variety of services.